Tim Andresen has come a long way from his humble beginnings back in 1986. He is the founder and owner of our What Happens label, and also co-owns the UK-based Savoir Faire Musique. Music has taken him to more than 35 different countries across Europe, Asia and South America, and at home ground he has held an on going residency at Culture Box since 2005 – described by Mixmag as “Copenhagen’s pioneering platform for cultivating electronic music”, and rated by Resident Advisor as “one of Europe’s best small clubs”. Month in, month out, he helps to secure the club its unique position, achieving worldwide recognition and 6 awards so far for Best Danish Club. Tim’s DJing skills have not gone unnoticed either, and resulted in him landing the ‘Best DJ’ award at Club Awards, and ‘Most Popular Nordic DJ’ award by Megamind. One to follow his dreams through equal parts of talent and hard work, Tim is an artist who enjoys the writing, production, engineering and arrangement of his own records. His production portfolio includes work for Re:FreshYourMind, Younan Music, Natural Rhythm, Ready Mix Records, Soulman Music, Seamless Recordings, UM Records, Southpark Recordings, Starlight Unlimited, Elevation Recordings, Gartenhaus, Deso, DeepWit Recordings and of course What Happens and Savoir Faire Musique. Not to mention that he was also behind the 2007 smash ‘Everybody’ on Azuli. He has also released on Toolroom as one of the ‘Leaders of the new school’, and on Southern Fried as half part of Professional Losers, dubbed ‘the next big Danish housers’ by iDJ Magazine after personally being asked to remix Fatboy Slim (#1 UK Buzz Chart). The list goes on. 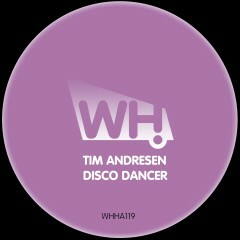 His new track is titled ‘Disco Dancer’ and is a deep percussion-driven terrace track with a playful bass line and a spoken vocal to round things off. It has been road tested to great response during the first months of the year and is now finally ready to do damage this summer.